High Definition Liposculpture is an advanced surgical procedure that combines cutting-edge technology (VASER) with state of the art techniques, resulting in a natural, sculpted appearance. Many healthy, fit people complain that they go to the gym but they have trouble achieving the muscle definition they desire. High Definition Lipo sculpture uses advanced liposuction techniques to selectively remove small deposits of fat surrounding specific muscle groups in order to enhance the visibility of the natural contours. People who choose High Definition Lipo sculpture don’t see it as a failure to achieve fitness, but an enhancement to their current form. Vaser Hi-Def was developed to create an athletic look in both men and women. It is not reserved for high-level fit people, but for normal people that desire to look the-best-ever. It can be performed in all adults according to their specific health condition. Vaser Hi-Def should not be performed after massive weight loss, or on patients with severe stretch marks in the abdominal area. It is not recommended for patients with marked muscular laxity or moderate to severe skin laxity. Hi-def liposuction is a surgical procedure so certain medical conditions can affect a patient’s eligibility for the procedure. Vaser High-Def is not a replacement for a fitness routine. Patients need to continue their fitness program following the Vaser High-Def procedure. 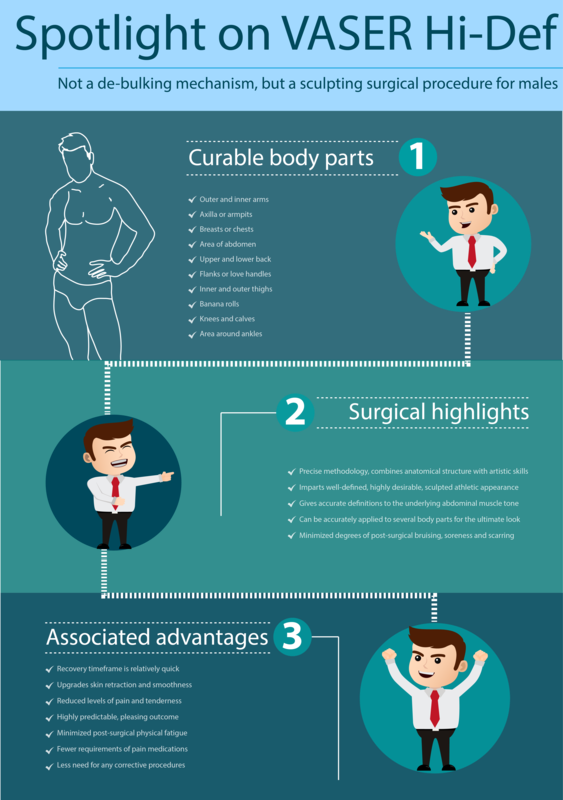 Consult with a certified Vaser Hi-Def surgeon to find out if Hi-Def lipo is right for you. The procedure of Vaser High-Def is a simple and fast one which can be performed in less than an hour to a maximum of 4hours generally under local anesthesia depending on the number of areas to be treated and amount of fat to be removed. While you listen to your playlist in the operating table, careful surgeons selectively remove fat off your stomach or the areas you have applied for making small puncture like incisions which will be hidden in the pubic hair and natural creases of the body. A hollow cannula is inserted into the incisions gently suctioning the abdomen to a thin fat pad and further over the external oblique, lineal alba and transverse inscriptions. This way, gradually the muscular contour is revealed. After the surgery there will be a bit of swelling which is normal, and is rather taken as an advantage wherein the six pack only gradually emerge with more natural looks as the swelling subsides. The patient will require 3 to 5 weeks to recover and rejoin work, and much of their regular life style. But they should be prepared to follow a strict diet plan an exercise. The final results of Vaser hi-def lipo sculpture takes time to show. In this time, you can hit the gym with normal workout regimes and as time goes by and the results appear your inmates will suppose your six packs have been acquired from the workout itself. The surgery for Vaser hi-def lipo sculpture is a minimal-invasive one. Patient’s can experience some minor pain and discomfort post-surgery which is normal and will fade off in two to three days. Avid attention of the patient is required for maintaining the post-surgery care as instructed by surgeon. That most commonly includes no smoking and no crash dieting. Moreover, there will be some special massage and other post-surgical care to ensure maximum results.